Loneliness is the illness of our time. Even medical research is warning us that it may be a bigger health risk than smoking or obesity. A stark warning which oddly contradicts the perception of cultural advancement in a technology-driven world. After all, we can communicate with far more people and in far more ways than ever before, and we’re connected twenty-four seven. Yet we can still feel desperately alone when together with others in a crowd of people. Technological communication and connection aren’t giving us what we need. Something is missing. We’re overlooking something critical to the human experience, and loneliness has become the dark plague that torments the human soul. It’s not a physical or a mental ailment, meaning it’s not the result of a deficiency in health. It’s not governed by serotonin or some other neurological chemical processes. We cannot rationalize it away, or medicate it away with pharmaceuticals. Painful loneliness can affect anyone with a healthy body and mind, of any age, background, or belief system. 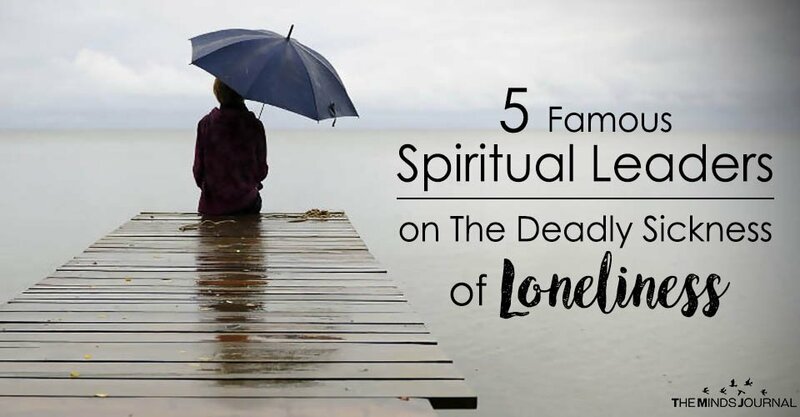 Loneliness is a spiritual illness. It is a dearth of a very important kind of connection, something other than the technological connection or even connection with the group. It is a crippling disorientation with the world we live in. Author Paulo Coelho, who is most well-known for his book The Alchemist, is someone who has experienced deep loneliness in his life, often writing on this theme in his many books. He speaks about the dynamics of loneliness, that paradoxical fact that sometimes we feel alone and do not like it, while at other times we feel like we need to be alone. A passage from his book Adultery sheds light on his perspective. It’s loneliness. Even though I’m surrounded by loved ones who care about me and want only the best, it’s possible they try to help only because they feel the same thing— loneliness— and why, in a gesture of solidarity, you’ll find the phrase “I am using, even if alone” carved in stone. Though the brain says all is well, the soul is lost, confused, doesn’t know why life is being unfair to it. But we still wake up in the morning and take care of our children, our husband, our lover, our boss, our employees, our students, those dozens of people who make an ordinary day come to life.